In this chapter, we will discuss a variety of spleen disorders. The spleen is located inside the abdominal cavity on the upper left side. A normal spleen weighs about 150 grams and is about 11 cm in length. Under normal circumstances, your spleen is about the size of your fist and hardly even detectable to touch during a physical examination. It has a rich blood supply and filters high volumes of blood. In the process, it is able to detect antigens and select damaged and old red blood cells and platelets for destruction. 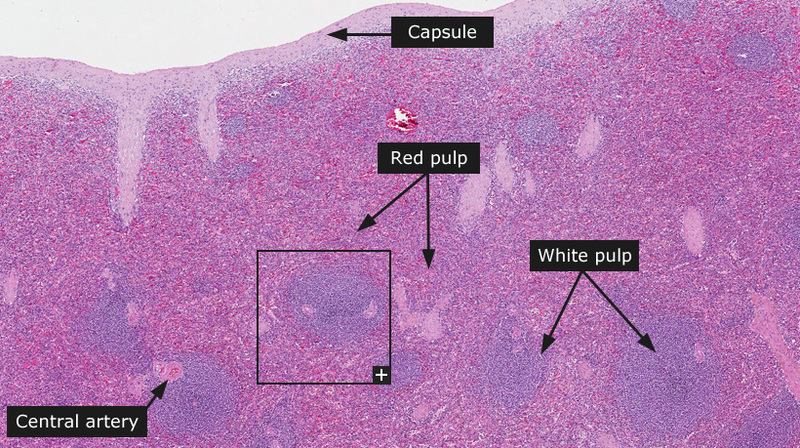 The spleen consists of red pulp and white pulp within a meshwork of reticular fibers enclosed by a dense connective tissue capsule. Blood vessels, lymph vessels, and nerves enter and leave the spleen through the hilum, an opening in the capsule on the medial side. From the capsule, connective tissue trabeculae extend into the organ. The trabeculae form a path for branches of the splenic artery, from which smaller arteries (central arteries) branch off to enter the pulp. The main constituents of the spleen, the white and red pulp, form two functionally and morphologically different units. The white pulp consists of lymphatic tissue and monitors the incoming blood for harmful substances. The densely packed heterochromatin of the lymphocyte nuclei is responsible for the dark blue staining observed when sections from normal spleen are stained with HE. Aggregations of lymphocytes envelop the central arteries in a periarterial lymphatic sheath (PALS). These are mainly T-cells. 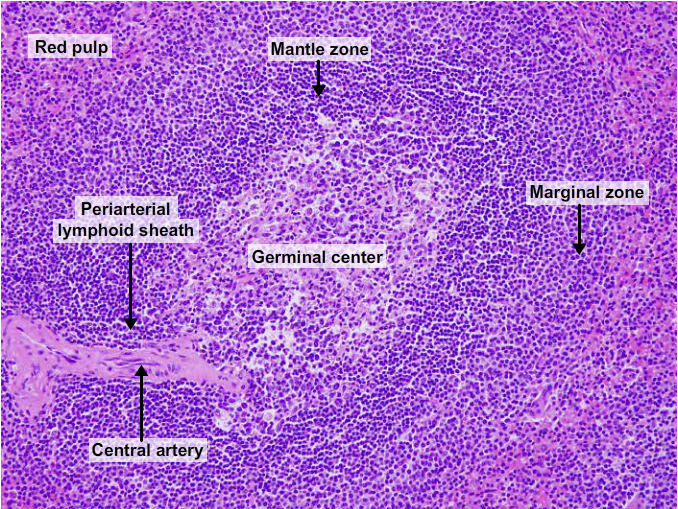 At places, the white pulp expands into greater spherical aggregations to form splenic nodules containing a light germinal center, consisting of proliferating B-cells, surrounding the B-cells is a darker stained mantel zone that marks the border to the red pulp. The splenic nodules have an appearance similar to lymph follicles, except for the presence of a central artery. The white pulp is a site of production and maturation of B cells and T cells. B cells in the spleen generate protective humoral antibodies; in certain autoimmune disorders (eg, immune thrombocytopenia [ITP], Coombs-positive immune hemolytic anemias), inappropriate autoantibodies to circulating blood elements also may be synthesized. The red pulp filters blood to find damaged and old red blood cells and platelets. Cells that are selected for breakdown are phagocytized by splenic macrophages. The abundance of red blood cells, erythrocytes, in the red pulp is accountable for the red, eosin staining observed when stained with HE. The red pulp consists of splenic cords and splenic sinuses. A meshwork of reticular cells and fibers, together with dendritic cells, macrophages, a relatively smaller amount of lymphatic cells and a great number of red blood cells constitute the splenic cords. Branches of the central arteries penetrate into the red pulp where they further branch into smaller macrophage sheathed capillaries. Within the splenic cords, the red blood cells are exposed to the macrophages and can be selected for the breakdown. The red pulp removes antibody-coated bacteria, senescent or defective RBCs, and antibody-coated blood cells (as may occur in immune cytopenias such as ITP, Coombs-positive hemolytic anemias, and some neutropenias). The red pulp also serves as a reservoir for blood elements, especially WBCs and platelets. 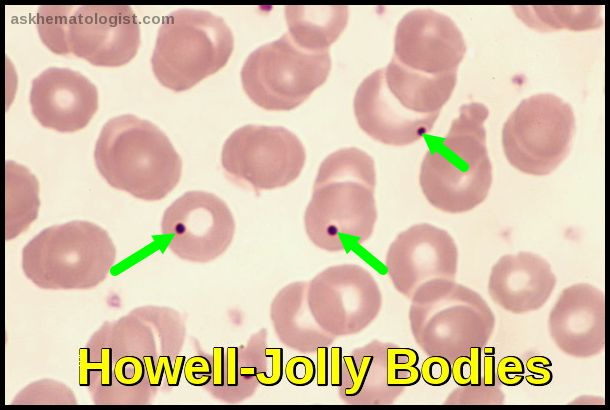 During its culling and pitting of RBCs, the spleen removes inclusion bodies, such as Heinz bodies (precipitates of insoluble globin), Howell-Jolly bodies (nuclear fragments), and whole nuclei; thus, after splenectomy or in the functionally hyposplenic state, RBCs with these inclusions appear in the peripheral circulation. Hematopoiesis may occur in the spleen if an injury to bone marrow (eg, by fibrosis or tumors) allows hematopoietic stem cells to circulate and repopulate the adult spleen (see Primary Myelofibrosis; see Myelodysplastic Syndrome). 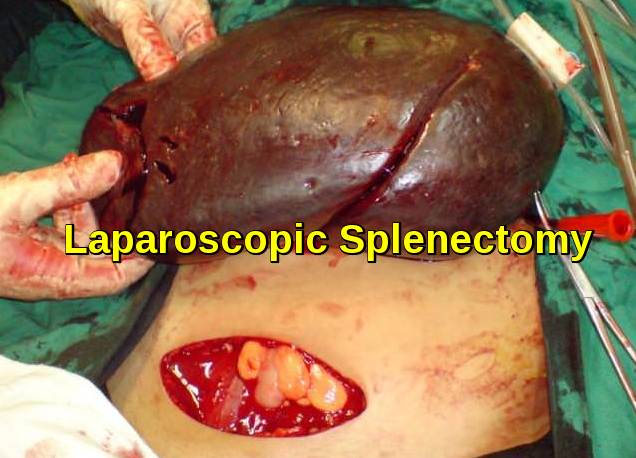 Splenomegaly is defined as enlargement of the spleen. In the past, splenomegaly was a clinical finding, but in recent years, imaging studies have also helped to assess for or confirm mild splenomegaly. The normal spleen is usually not palpable, although it can sometimes be palpated in adolescents and individuals with a slender build. However, an enlarged or palpable spleen is not necessarily of clinical significance. For example, certain individuals with broadly splayed costal margins have readily palpable, but small, spleens. 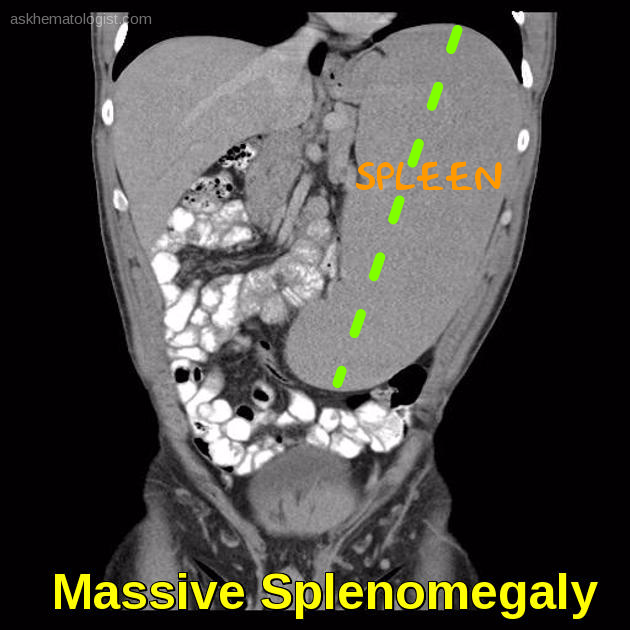 A spleen weight of 400-500 g indicates splenomegaly, while a weight of more than 1000 g is labelled massive splenomegaly. Poulin et al defined splenomegaly as moderate if the largest dimension is 11-20 cm, and severe if the largest dimension is greater than 20 cm. If splenomegaly is massive (spleen palpable 8 cm below the costal margin), the cause is usually chronic lymphocytic leukemia, non-Hodgkin lymphoma, chronic myeloid leukemia, polycythemia vera, myelofibrosis with myeloid metaplasia, or hairy cell leukemia. Feeling full without eating or after eating only a small amount from the enlarged spleen pressing on the stomach. Severe pain suggests splenic infarction. Recurrent infections, symptoms of anemia, or bleeding manifestations suggest cytopenia and possible hypersplenism. A number of infections and diseases may cause an enlarged spleen. The enlargement of the spleen may be temporary. Viral infections, such as infectious mononucleosis. Bacterial infections, such as syphilis or infective endocarditis. Parasitic infections, such as malaria. Cirrhosis and other diseases affecting the liver. Various types of hemolytic anemia. Blood cancers, such as leukemias, myeloproliferative neoplasms, and lymphomas. Metabolic disorders, such as Gaucher’s disease and Niemann-Pick disease. connective tissue disorders, such as Rheumatoid Arthritis and SLE. Pressure on the veins in the spleen or liver or a blood clot in these veins. On CT, a splenic width measurement (largest anterior-posterior measurement on axial images) of greater than 10.5 cm is the most accurate single measurement for mild to moderate splenomegaly, while a cranial-caudal height measurement of greater than 14.6 cm is the most accurate single measurement for massive splenomegaly. On sonographic assessment, a length of 12 cm is generally considered the upper limit of normal. Clinical assessment begins with a thorough History and Examination. History may elicit symptoms of pressure effects from the enlarged spleen e.g. left hypochondrial discomfort or early satiety. Symptoms of cytopenias due to hypersplenism: a syndrome comprising splenomegaly; anemia, leucopenia and/or thrombocytopenia; compensatory bone marrow hyperplasia. General systemic symptoms such as fever, sweats, weight loss or lymphadenopathy suggest hematological, malignant, infectious or inflammatory disease. A thorough systemic enquiry is essential to recognise multi-system disorders such as the collagen diseases and sarcoidosis. Past medical history may suggest the cause of splenomegaly, though further investigations will be indicated if the presentation is unusual (e.g. massive splenomegaly in a patient with mild congestive cardiac failure). A family history should be carefully elicited, such as of malignancy or anemia; note that individuals with autosomal recessive conditions like Gaucher’s disease often have no affected family members. Risk factors should be identified for liver disease particularly alcohol intake, and for infectious diseases (travel, sexual contacts, intravenous drug use, exposure to animals and predisposition to infective endocarditis). The sensitivity for detection of ultrasound-documented splenic enlargement is 60 to 70% for palpation and 60 to 80% for percussion. Up to 3% of normal, thin, people have a palpable spleen. Also, a palpable left upper quadrant mass may indicate a problem other than an enlarged spleen such as a hypernephroma. General examination may reveal fever, lymphadenopathy, anemia, signs of hepatic or inflammatory disease, stigmata of endocarditis, or involvement of any other organ system. Other helpful signs include a splenic friction rub that suggests splenic infarction and epigastric and splenic bruits that suggest congestive splenomegaly. Generalized adenopathy may suggest a lymphoproliferative, infectious, or autoimmune disorder. Full blood count, peripheral blood film, ESR, clotting. If the differential count reveals a lymphocyte predominance, flow cytometry should be performed. Results consistent with neoplasm may prompt fluorescence in situ hybridization (FISH) or polymerase chain reaction (PCR) testing for BCR-ABL or Jak 2. Depending on the apparent etiology, bone marrow biopsy may be needed. Urea and electrolytes, Liver function tests, C-reactive protein, Bone biochemistry, Serum LDH, Vitamin B12, red cell folate. Immunology: Auto-antibodies including ANA, Rheumatoid factor. Haematology: Direct antiglobulin test, Reticulocyte count, Malaria blood film, Haemoglobin electrophoresis/HPLC. Biochemistry: Serum ACE, Serum protein electrophoresis, Urine Bence Jones protein (Sarcoidosis, Amyloidosis). Microbiology: Peripheral blood cultures, sputum microscopy, culture and AAFB, Mantoux test. Serology: HIV, CMV, toxoplasmosis, Brucella. Radiology: Ultrasound abdomen with duplex-Doppler studies, CT chest abdomen, and pelvis, Transthoracic/transoesophageal echocardiogram. Treatment for an enlarged spleen focuses on the underlying problem. For example, if you have an infection, treatment will include antimicrobials. If you have an enlarged spleen but don’t have any symptoms and the cause can’t be found, your doctor may suggest watchful waiting. You’ll have to see your doctor for reevaluation in six to 12 months or sooner if you develop any symptoms. If an enlarged spleen causes serious complications or the cause can’t be identified or treated, surgical removal of the spleen (splenectomy) may be an option. In chronic or critical cases, surgery may offer the best hope for recovery. 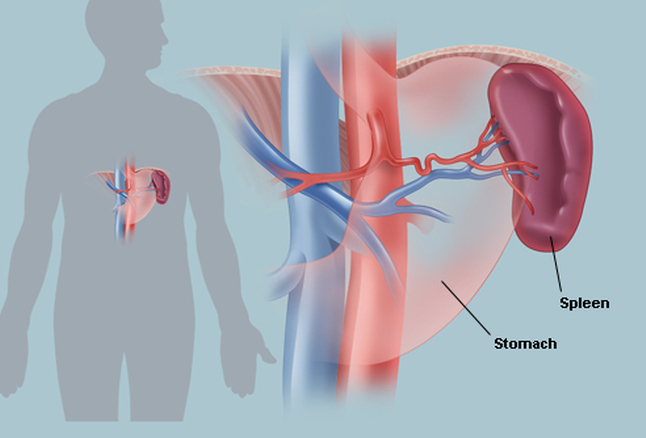 Elective spleen removal requires careful consideration. You can live an active life without a spleen, but you’re more likely to contract serious or even life-threatening infections after spleen removal. Sometimes radiation can shrink your spleen so that you can avoid surgery. A series of vaccinations both before and after the splenectomy. These include the pneumococcal (Pneumovax 23), meningococcal and haemophilus influenzae type b (Hib) vaccines, which protect against pneumonia, meningitis, and infections of the blood, bones and joints. You’ll also need the pneumococcal vaccine every five years after surgery. Taking penicillin or other antibiotics after your operation and anytime you or your doctor suspects the possibility of an infection. Calling your doctor at the first sign of a fever, because this may indicate an infection. Avoiding travel to parts of the world where certain diseases, such as malaria, are common. Avoid contact sports — such as soccer, football, and hockey — and limit other activities as recommended by your doctor. Modifying your activities can reduce the risk of a ruptured spleen. It’s also important to wear a seatbelt. If you’re in a car accident, a seat belt can help prevent injury to your spleen. Finally, be sure to keep your vaccinations up to date because your risk of infection is increased. That means at least an annual flu shot, and a tetanus, diphtheria and pertussis booster every 10 years. Hyposplenism is not a rare condition and can complicate a remarkable number of illnesses. Hyposplenism is seen in patients with sickle-cell disease and is due to recurrent splenic infarctions, but it may also occur in patients with coeliac disease or dermatitis herpetiformis. Occasionally it may be seen in patients with essential thrombocythemia and ulcerative colitis. Hyposplenism is relatively easy to recognize by typical changes observed on the peripheral blood smear; including Howell–Jolly bodies, monocytosis, lymphocytosis, and increased platelet counts. Diagnosis can be confirmed by pitted RBC counts or 99Tc-labelled radiocolloid scan of the spleen; wherever available. Diagnosis needs to be made promptly to institute pneumococcal vaccination in a timely fashion and to recognize and treat bacterial infections promptly and aggressively because of the tendency of hyposplenic subject to develop fatal invasive disease. Overwhelming pneumococcal sepsis accounts for the major mortality cases in hyposplenic subjects; however severe infections with other encapsulated bacteria and protozoa have been reported. Hyposplenic individuals may also be at a higher risk for vascular, autoimmune and thrombotic diseases and they may have a higher risk of developing solid tumors. The commonly used pneumococcal polysaccharide vaccine is ineffective in asplenic subjects, because it requires the presence of IgM memory B cells, and should be given before splenectomy. In splenectomized, and functionally hyposplenic subjects, the pneumococcal conjugate vaccine is more effective, because it utilizes a T cell dependent mechanism, and should be the preferred vaccine in these circumstances. Eichner ER. Splenic function: normal, too much and too little. Am J Med. 1979 Feb. 66(2):311-20. Nuffer Z, Marini T, Rupasov A, Kwak S, Bhatt S. The Best Single Measurement for Assessing Splenomegaly in Patients with Cirrhotic Liver Morphology. Academic Radiology. 2017. Pozo AL et al. Splenomegaly: investigation, diagnosis, and management. Blood Rev. 2009 May;23(3):105-11. 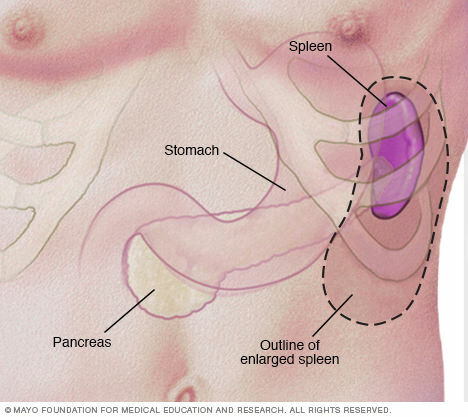 Enlarged spleen (splenomegaly) – Diagnosis and treatment – http://www.mayoclinic.org/diseases-conditions/enlarged-spleen/diagnosis-treatment/drc-20354331 Accessed: Aug. 03, 2016. Hey.my baby is 3months old.his spleen size is 8cm .which is 6cm required.is it harmful or dangerous for him??? Can you send me his full blood count please (FBC)?